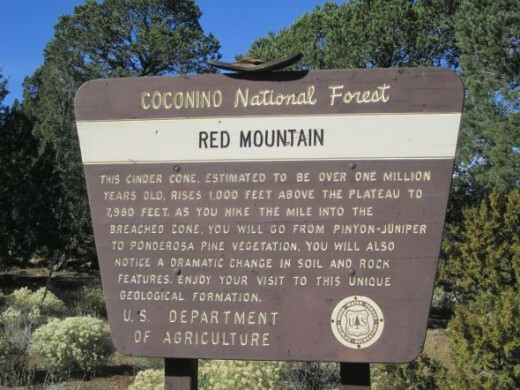 Located in the Coconino National Forest, twenty-five miles northwest of Flagstaff, you'll find a volcanic cinder cone called Red Mountain. 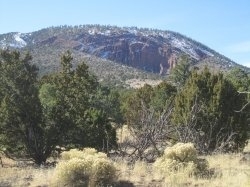 Red Mountain is unusual in that it forms a U-shape rather than being symmetrical like most other cinder cones. On its northeast side is a large natural amphitheater with pillars or "hoodoos," formed by erosion and speckled with black crystals. The hike to Red Mountain is easy, but there's plenty to see and explore along the way and once you arrive at your destination. So, stay a while. 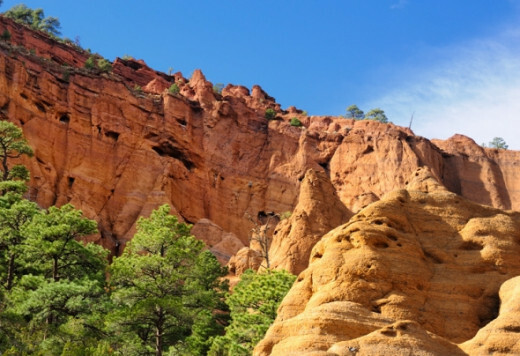 Bring a picnic lunch to enjoy while listening to the birds that make their homes in the little pockets in the red rock, which contrasts beautifully against the bright blue Northern Arizona sky and evergreen ponderosa pine, pinion and juniper. Unless otherwise noted, all photos on this page were taken by me. All rights reserved. Thanks! 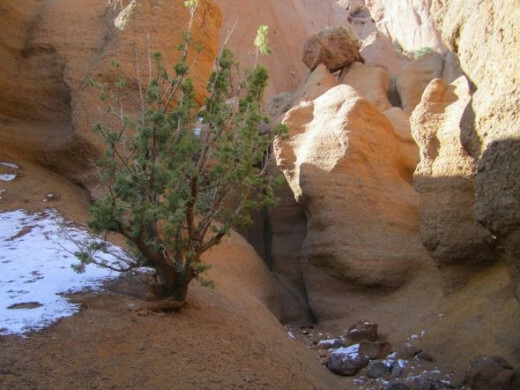 Have You Hiked Red Mountain? No, but I'm planning to. 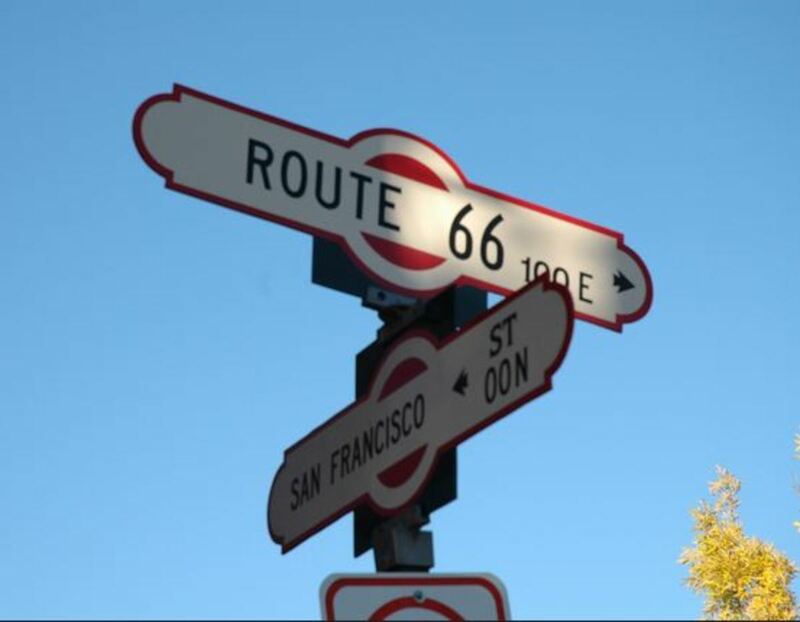 From Route 66 downtown, take Humphreys Street north to the "T."
Turn left onto Fort Valley Rd./Route 180. Stay on 180--pass Snowbowl Rd. and the Nordic Center, and keep going for a total of 25 miles from Flagstaff. Look for the green Red Mountain Trail sign on the right-hand side of the road. Turn left onto the unpaved access road. From there, it's a well-graded, short drive of roughly 1/4 of a mile to the parking area. You do not need a high-clearance vehicle to access the trailhead. Sedans are fine. 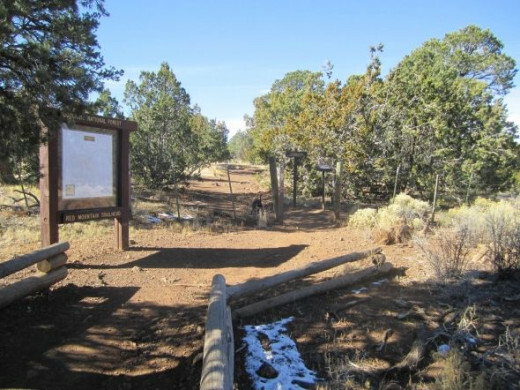 This is one of the best Flagstaff hiking guides around. The 97 hikes in this edition have been totally upsdated to include GPS coordinates. 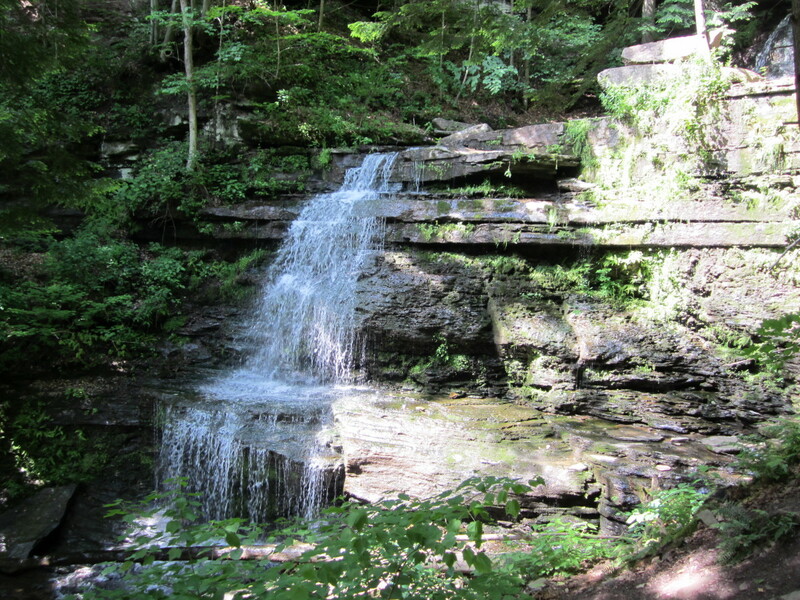 The user-friendly format features each hike shown on facing pages with directions to the trailhead, a description of the hike, and a color photograph and map. Also included is an elevation change graph, season-to-hike chart, difficulty/mileage graph and a how-crowded icon. First released in 1992, the authors have worked constantly to keep this guide updated and current through this latest edition. 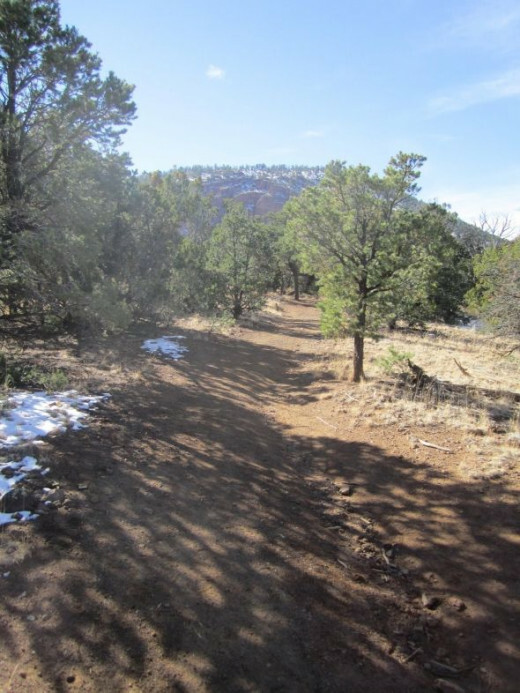 The trail is generally very flat and sometimes sandy, as it follows an old road and then a dry wash. 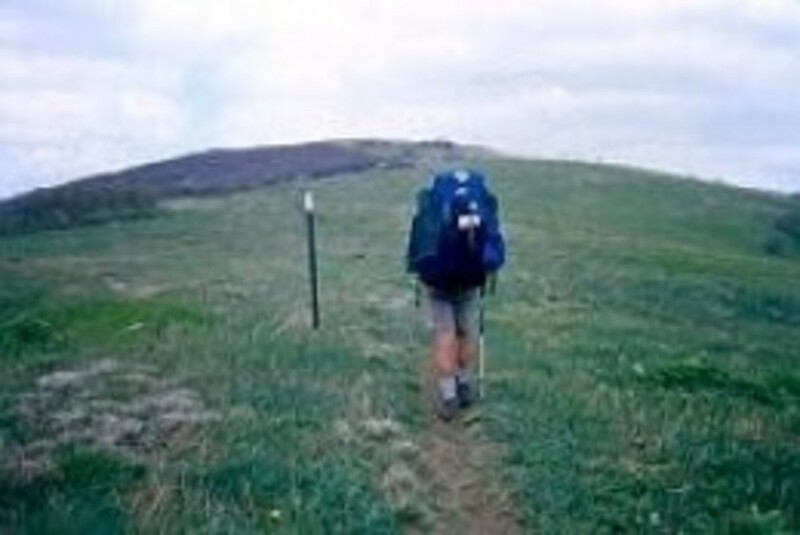 This is an easy walk, but, as with all hikes, wear comfortable shoes. And I don't recommend open-toed footwear due to all the sand and cinders. 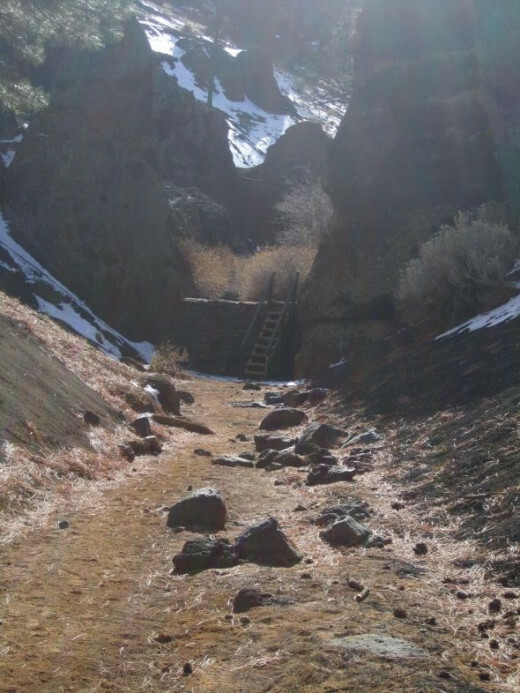 The only exception to the trail's flat profile is this ladder (below) just before the amphitheater. Small children and dogs may need a lift on the way in and the way out. The Big Red Mountain Climb - Not! Small children and dogs may need a little assistance getting up and down, but otherwise it's just a ladder. 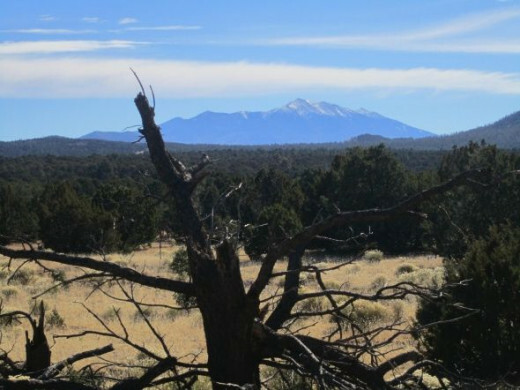 View of the San Francisco Peaks from the Red Mountain Trail - The tallest summit you see there is Mt. Humphreys at 12,633 feet. Another form of "rock art"
I believe these are solidified volcanic cinders. 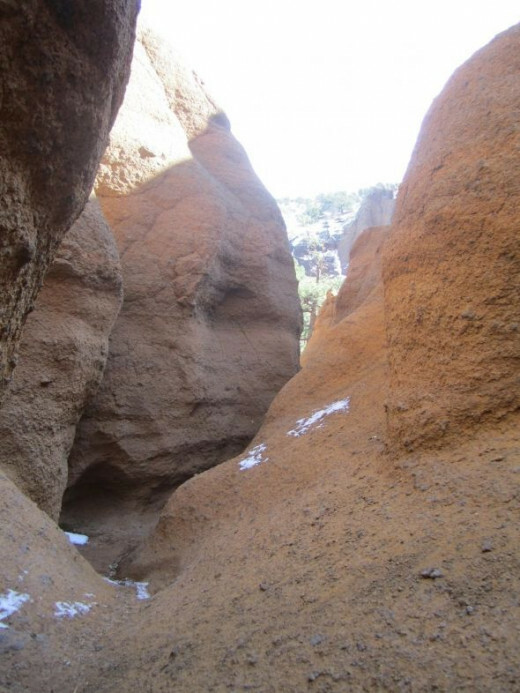 Explore Red Mountain's Inner "U" - You can wander around and through the hoodoos along some narrow passageways. It's fun to explore the maze of nooks and crannies. 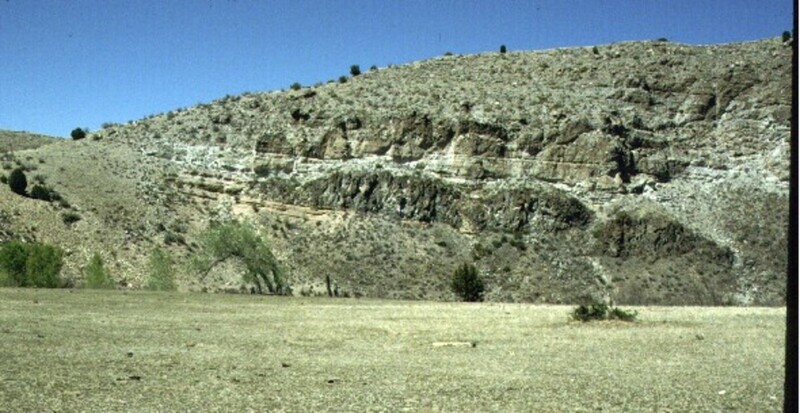 The amphitheater pictured above is not the volcanic vent that created Red Mountain. 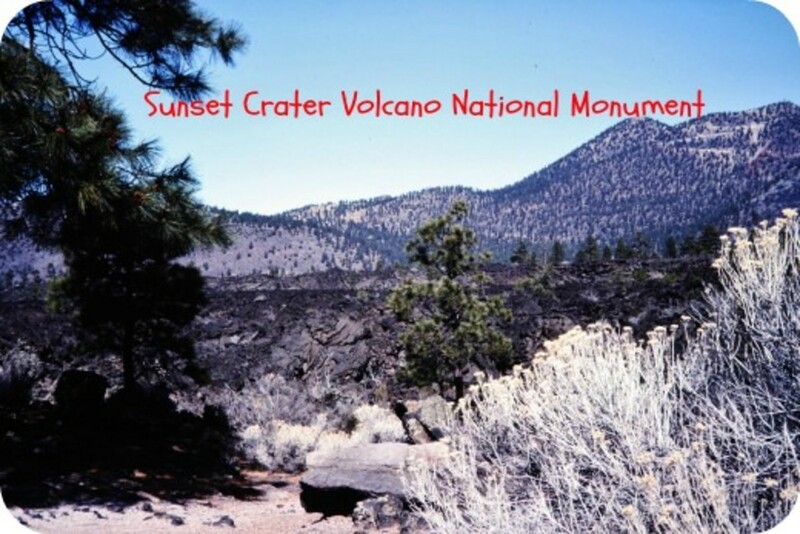 That vent is on the southwest side of the cinder cone. "The origin of this natural amphitheater has not yet been fully explained. 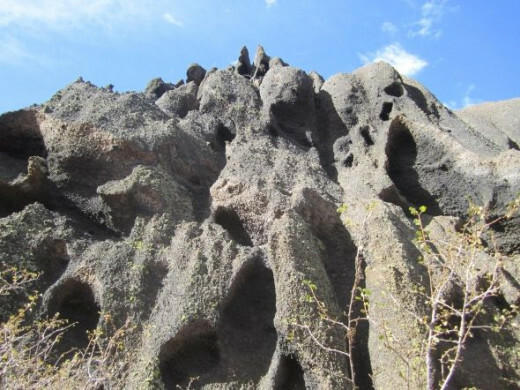 Water erosion would be the obvious choice, but Red Mountain lacks the surface area and features that could have channeled enough water to erode this much material from the flank of the cinder cone in only 740,000 years. One seriously considered theory is that the amphitheater was originally created by steam explosions soon after the cone was formed with water erosion continuing the process for the thousands of years since. These steam explosions would have been caused by rainwater seeping into the cinder cone and circulating through the still hot cinders depositing a mineral cement. At temperatures over 600Â°F, this would have created conditions akin to a pressure cooker and ultimately this pressure overloaded the mineral cement causing a series of steam explosions." The above photo is used compliments of landscape photographer, Christopher Eaton. See his work at TerraPhotographica.com. This photo of the Red Mountain amphitheater and many other images from northern Arizona and the rest of the Colorado Plateau and beyond are available as archival prints and gallery wraps. Comments Or Questions About Red Mountain? - Or any other Flagstaff hike? This reminds me of some of the hikes in Utah. Lovely formations. Thanks for the review. Ramkitten, you've done it again, another good lens. This looks like a nice hike. As I've come to expect, your beautiful photography just blows me away. I haven't spent much time outdoors for the last couple of years, but I think looking at your lenses just might get me out there! Lovely photos! 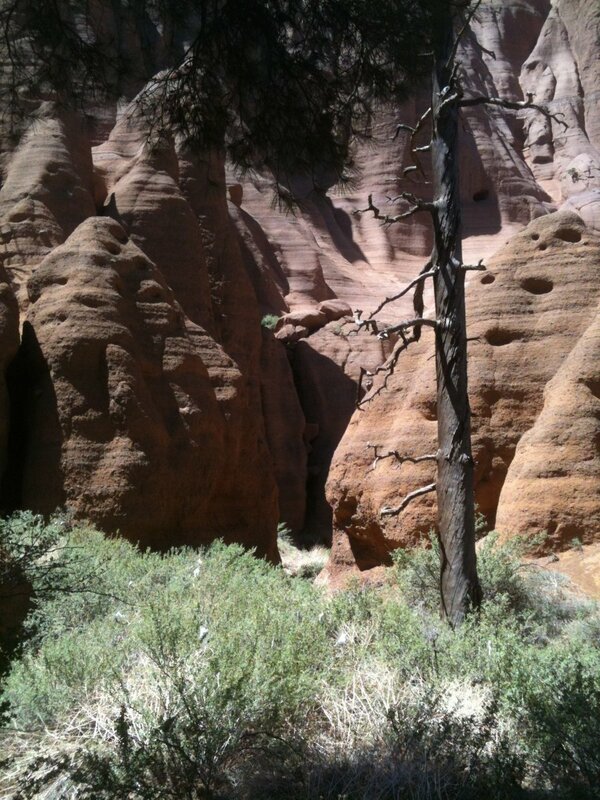 I was struck by the trees - when I was in Tucson there were no trees anywhere (only cactus). Such beautiful Rock formations, they really look other-worldly or out-of-this world rather!! 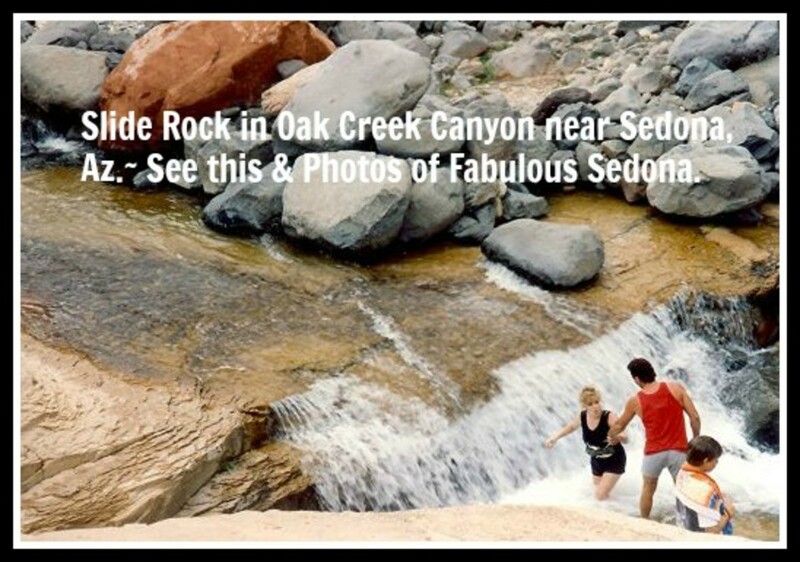 Looks like a fantastic hike, although I might be inclined to do it sometime other than mid-summer. I can't remember the elevation there, or the summer temps. Loved the pictures! I love your hike lenses. They are almost a virtual hike for me. Thanks for the virtual fresh air! Gorgeous looking area, I will have to put this on my list of places I need to visit.